without any artificial aids, such as a tank of oxygen or even a snorkel. It is a crazy and often quite dangerous sport. Its practice is more controlled over recent years due to fatalities. But now free diving is more restrained and very careful about safe practices and limits. You should never try freediving in the Maldives, or anywhere else, when you are alone. We’ve all tried holding our breath for as long as possible. How long did you last? Maybe 30 seconds, or maybe a minute? And how long can you do it under the water? And how deep were you? The bottom of a 10 foot swimming pool, with the pressure on your ears nearly unbearable? Freedivers can go deep underwater and some can hold their breathe for 5 minutes before surfacing. They push their body to its limit. Freediving gives you a sense of euphoria, Freediving as a recreational activity, is celebrated as being relaxing, liberating and a unique experience, completely different from SCUBA diving. 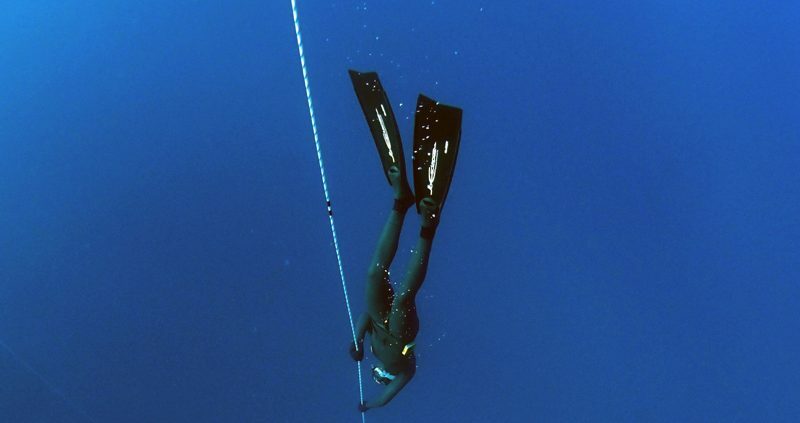 Freediving takes time and training, do not attempt to go freediving in the Maldives without experienced help. If you have never tried before do your research and take a course.